Breaker blows on compact machines are delivered anywhere from 150 to 1,500 times a minute depending upon the hydraulic gallons-per-minute (gpm) flow rate of a carrier. While all that force is concentrated on the point of a bit, some of it is propelled backward. 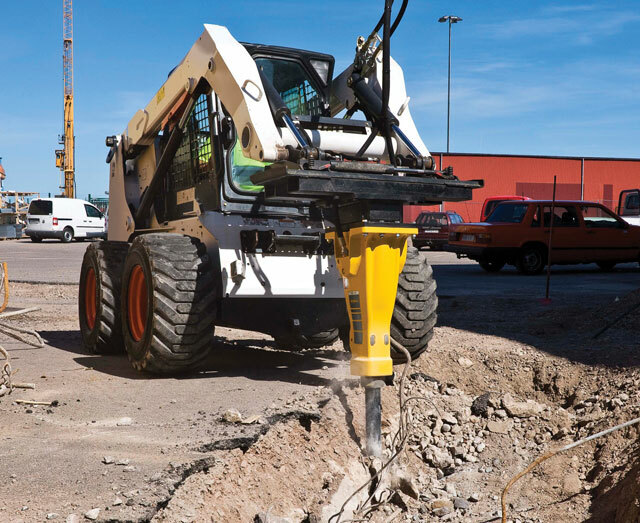 The series of skid steer-sized breakers manufactured by Epiroc (until January of last year, the name was Atlas Copco) tries to harness the rearward thrust using what it calls its Energy Recovery System. Dust is an issue. Epiroc SB breakers were the first in the industry to offer a water-spray dust suppression system. They must be durable to contain the explosive force in each thrust of the piston. One of the ways breaker manufacturers build in durability is by minimizing components. Epiroc calls its small hammer products “Solid Body breakers,” an allusion to the single casting construction method employed for the body of the breaker. The manufacturing process creates relatively slim breakers, which is an advantage for working in tight spaces. 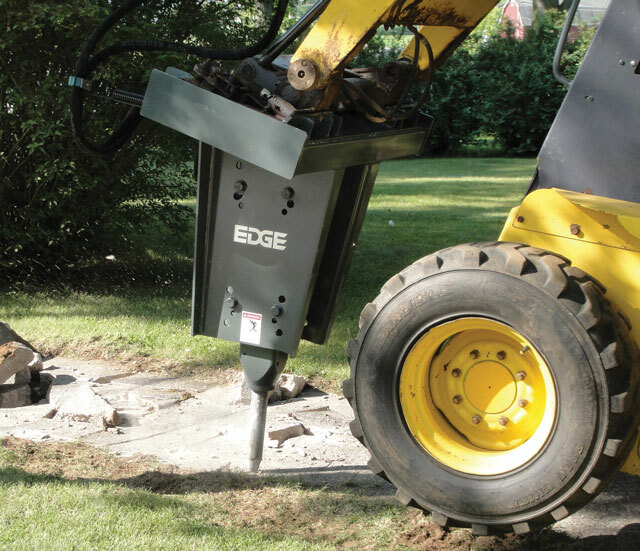 An Edge breaker has a mono-block design with two moving parts. The breaker’s advanced hydraulic circuit provides increased flow to the valve and piston, giving operators faster cycle times and increased tool penetration. Toku Striker breakers and Paladin Strike Force breakers also tout two moving parts — a control valve and piston. Dust also is an issue. Epiroc SB breakers were the first in the industry to offer an integrated water-spray dust suppression system. It was introduced years ago because of environmental regulations abroad. The system is newly relevant in the United States because of hovering OSHA silica dust rules. It is a standard feature on the SB Series of Epiroc breakers, with a port already cast in the breaker body for affixing a water line. Edge’s product manager says the gpm flow of the unit carrying the breaker should be the primary consideration in picking a breaker, rather than weight. Such a value has not been computed for hydraulic breakers. Logically, a certain amount of weight is an advantage when a tool is bearing down on a seemingly impenetrable material. Yet the efficiency of a breaker generally is deemed more important than its dead weight. So, today’s breaker attachments for compact machines are hard-hitting and come in relatively quiet versions, but how do they hold up under the strains of their destructive work? Wear items wear out, of course — the chisel, the retainer and bushings going first — but automatic-grease options spurt a little lubricant each blow to keep other friction to a minimum. And, against all odds, the tools keep battering. 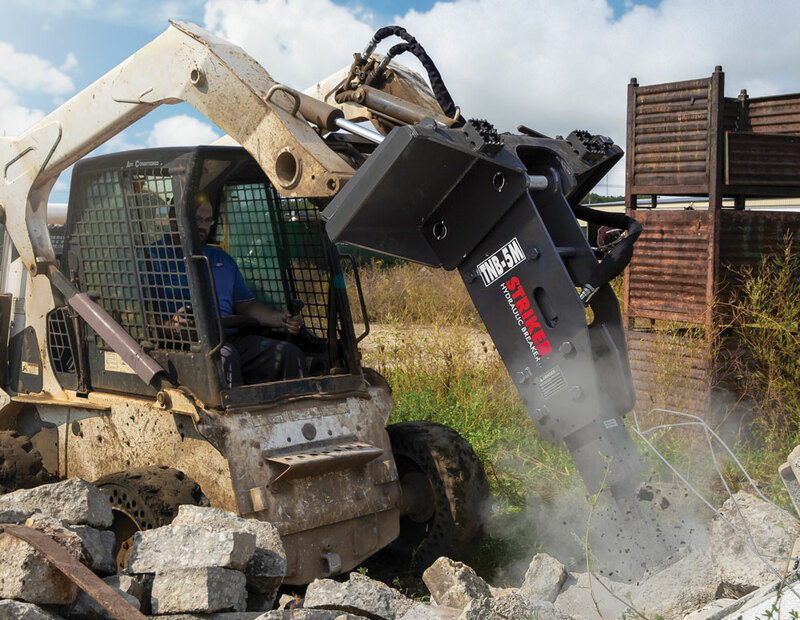 Toku offers a vote of confidence that its demolition attachments will continue to pound away: a three-year warranty on the body of each Striker breaker. Hard to beat that. Giles Lambertson is a freelance writer for Compact Equipment.